Speaking of difficult books…and I know I told myself to read more poetry (and I am, really, most recently Michael Burkard’s Fictions from the Self)…I am entranced and overawed by Barbara Cassin’s amazing Dictionary of Untranslatables: A Philosophical Lexicon. Here’s a thorough and intelligent review by Michael Kinnucan, going into more depth than I have time to post on this blog. What I want to mention about the text is its beauty and its acknowledgment of ambiguity, a quality that translates (ha!) into every aspect of human existence: our ambiguous relationships with our environments, with other humans, with our foods and our governments, our psyches, our cosmos. We cannot write about the act of translation without encountering ambiguity. We cannot really address philosophy without acknowledging that differing perspectives [context, culture, era, psychology, and of course, language] pose serious complications to understanding across languages and cultures. And even within a culture! For jargon and specialized terms can make understanding by even the most educated layman very, very difficult indeed. While Cassin’s tome–and it is a collaborative work, with many brilliant people as contributors–presents itself as a philosophical lexicon, the connections with other disciplines (psychoanalysis, for example, with Freud’s famous coinages, and certainly poetry) are unavoidable. It may be challenging to translate the German Schicksal, a Kantian form of the idea we call in English fate, but in such cases the reader is generally going to be familiar with Kant and perhaps aware that the subtle connotations may vary. Take the word sign, however, and each reader–even those who have linguistics or anthropology or philosophy as a background–brings his or her own connotations to the definition and to the problem of translating what any individual author means by the use of the word. Maybe this doesn’t sound fascinating to you. I relish it! And who knew (I sure didn’t) that even the word reality is a neologism, “coined by Duns Scotus” in the 13th century? At 1200 pages of small type, this text is a tool, not a beach read. What a find, though. I have no doubt I will be referring to it for years to come, and that it will keep me wallowing in marvelous ambiguities. Where did the doubt and the passionate “need to make a task of art” begin? I can probably come up with dozens of possible answers for myself. I’ll mention just one right now, the way I learned to feel about visual art. 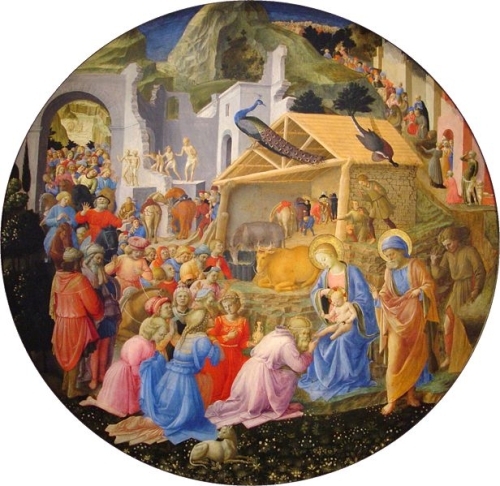 A framed print of the painting shown here [The Adoration of the Magi, by Fra Angelico and Lippo Lippi] hung on the wall when I was very young. It was the most fascinating object in the house. I spent what seemed like hours gazing at its details, finding the animals among the throngs of people, old men, and young women with their hair in roped braids, children and peasants and half-naked lepers amid the ruins. I knew the story well, but the way it was told in this painting engaged me more completely than any other way I’d absorbed the Christmas narrative. And it was round! It was the only round picture I’d ever seen. This Adoration moved me, even though I was only six years old. The idealized, pastel paintings of Jesus that hung in the Sunday school rooms were bland and static by comparison; they did not make me want to love the pretty man in the clean robes. But this painting! Even the peacocks adored the Baby Jesus. And yet the picture contained more than adoration and joy. Pain was implicated–the beggars, the cripples–decay was there in the broken-down building. Horses stamped impatiently; some of the people turned away. The whole thing was full of tension and human frailty and doubt as well as gladness. It strikes me, now, that doubt is one of our tasks; for it is through uncertainty, curiosity, mild skepticism, and a willingness to weather the problems and puzzles of ambiguity that we keep alive our passion for the task of art, to make new, to express, to challenge, and to celebrate. That is what the devoted students in Nafisi’s book manage to cling to as they read “dangerous” books in Tehran. And that’s perhaps what Henry James meant when he stated that we work in the dark. If the madness of art exerts itself through the tasks, the doubt, and the passionate devotion to doing what we can–well, I can live with that. “Text” has taken on new meanings during the past 10 years or so, informally and formally. For one thing, in its techno-language sense, it has become a verb: “Text me later today.” It is a word that has likely undergone a huge uptick in frequency of usage in recent years. Even in the realms of academe, “text” has for some time now been used to refer to things which are not, strictly speaking, texts: movies, advertisements, and art, for example. We can view archeological sites as texts, as palimpsests that layer one era upon another. Derrida offered us a method to using some of these concepts through deconstruction, “an effort to understand a text through its relationships to various contexts” (in a 1988 translation). This post is not about deconstruction. Context: it contains the word text (from the Latin texere, to weave; context, therefore: to join together, structure). When I tutor students in writing papers, I stress context. What are you writing about, what are your sources, what era, what place, which people or theories or machinations are involved? Give us a structure on which to layer your observations, research, or argument. This post is not about composition or research papers, either. Well, not exactly. What I want to write about—briefly, and perhaps more another time—is some old-fashioned texts recently unearthed from my parents’ house. My mother handed me a paper bag full of texts that includes letters I sent when I was a young adult living on my own for the first time, letters friends wrote to me and to my sister, high school transcripts, essays written my freshman year at college, poems composed in my junior year at college, as well as—amazingly enough—report cards not only from my childhood but from my parents’ elementary-school years and an essay my father wrote while he was a junior at Wabash College in, as near as I can calculate, 1953. This last item fills me with a tenderness I find difficult to describe or explain. 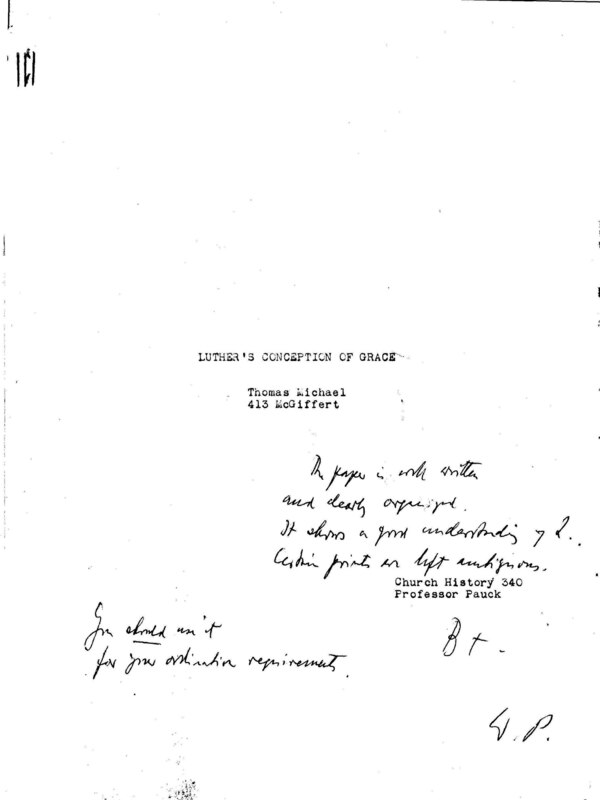 Typed on a manual typewriter I later used in my college years, on now-yellowed linen-content paper, stapled at the corner with four still-unrusted staples, “Luther’s Concept of Grace” is a 14-page essay for a class entitled Church History 340. The text on which his essay is based was Martin Luther’s A Commentary on Saint Paul’s Epistle to the Galatians from an anonymous translation into English dated 1575. The copy he read was published in London in 1830. My father went on to pursue theology, pastoral care, psychology, and teaching; emotion mattered to him. At 21 years old, and in the context of an examination of Martin Luther, he didn’t know how to phrase the valuable emotional aspect of grace (substantial or not) he intuited as necessary. Perhaps Luther did not possess this characteristic—in fact, from my admittedly limited reading of his work, he seems not to have. My father does possess this trait. I think what this text evokes in me is the awareness that he was who he is even when he was youthful and inexperienced and hadn’t read or learned a fraction of what he knows now. The context for this 60-year-old text matters to me personally in terms of its relationship to me and to the man who raised me, among other possible relationships tactile, historical, socio-cultural or otherwise, and—richly and often—ambiguous.